Four schools operated by the Triangle Tech Group recently received the School of Distinction Award from the Accrediting Commission of Career Schools and Colleges of Technology. The award recipients are Triangle Tech, Pittsburgh, PA; Triangle Tech, Erie, PA; Triangle Tech, Greensburg, PA; and Triangle Tech, DuBois, PA. The School of Distinction Award recognizes ACCSCT accredited schools which have demonstrated a commitment to the expectations and rigors of ACCSCT Accreditation Standards, as well as, a commitment to delivering quality educational programs to the students, graduates and employers that deserve a school’s best work. 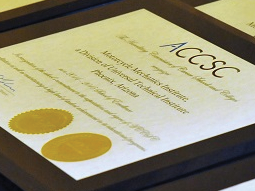 Through this award, the Accrediting Commission recognizes the importance of this significant achievement, which includes completing the accreditation process without stipulation. ACCSCT presented the School of Distinction awards to Triangle Tech at its Annual Business Meeting, which was held in Las Vegas, Nevada. The Triangle Tech Group is headquartered in Pittsburgh and operates schools in Pittsburgh, Erie, Greensburg, DuBois and Sunbury, PA.